The form factor you choose to create your work habits is more important than the tools you have; let us agree that the biggest challenge Real Estate Agents face is themselves, or more precisely the box of ‘work behavior’ they have created for themselves. It is known that Real Estate Agents are independent contractors, so they are free to create the form factor of their workplace; yet this is precisely what gets in the way of most of them thriving. All of you have experienced the feeling you get when you are getting ready to go out on a Saturday Night; the process of getting groomed, putting nice clothes, playing music puts you in the mood for going out – well it is the same with work. You need to create the environment that puts you in the mood to ‘work,’ and very few people are able to achieve that at home; that makes sense, it is your home after all. If your spouse sees you sitting in front of laptop, it does not matter that you need to concentrate to work on your deals, they will say: ‘I am going to the store watch kids while I am out!’ To your spouse the work you do at home from your computer is add-on work, it is not the REAL work of Real Estate; in your spouse’s mind Real Estate work only happens when you are showing property. 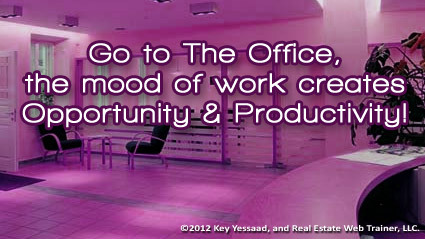 My advice: Go to the office and get to work – very few of us have the structure at home to separate work from family!